So here is a project I will be doing with Grade 5. 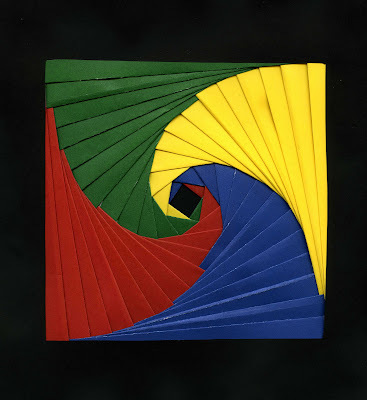 Iris folding originated in the Netherlands. The spiral resembles the iris of a camera. It is used in card making and there are a gazillion patterns on the web but they are all based on a few simple templates. I find the template patterns to be works of art in their own right and with a black background and bright colors they are stunning. Both my daughter and I are very taken with this technique and it is a lot easier than it looks. Print off the template you like. Circle of Crafters has a lot of patterns. 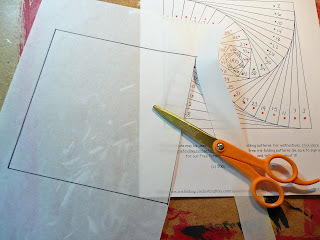 If you have tracing paper trace around the outer edge of pattern and cut out. If you don't have tracing paper just print out a second copy of the pattern and cut out. Put a little tape on the back of the cut out. Then place on your black cardstock. Trace around it with a pencil or white pencil crayon. Cut it out using scissors or a craft knife....the grade 5's will be using scissors. 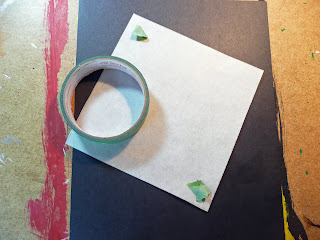 Place the cut out black paper over top the template pattern and tape temporarily into place. Choose the papers you want to use. It depends on what template you choose how many different colors you will need. The square one takes 4 the triangle takes 3. There are other templates that take 5. Using a ruler mark off strips about 1 and 1/2 inch wide. 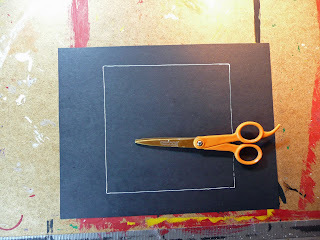 Cut the strips using scissors or a paper cutter. At school I can use the big cutter. Fold your strips in half. The easiest way to do this is to start in the center and then smooth the fold line out the sides. The first time I tried this I used construction paper but found it tears very easily...a bit frustrating for the kids. Colored cartridge paper works well as well as scrapbooking paper....if you can try to pick paper that is colored on both sides. A lot of the scrapbooking paper is white on the inside and sometimes if your fold is off it may show thru in the final design. Starting at #1 on your template place your first color down...you want the folded edge of your colored paper on that line facing towards the center. You can either use a glue stick or tape to secure the paper.... tape is easiest. Trim the paper as you go just make sure you leave enough of a overhang for taping. Following your numbers keep taping down your strips. You'll see the pattern taking shape and your strips will get shorter. As you get to the center watch your numbers as the pattern will really start to turn. When finished remove the template you temporarily taped to your black paper. 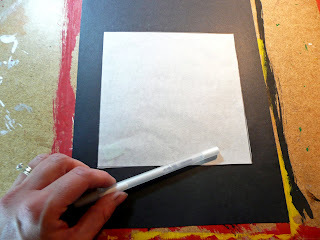 Put some glue along the edges of your paper. Place another black piece of paper on top sealing away all those ugly taped ends. Turn over and Ta Da!! An amazing piece of art. Very cool! It looks hard, but I'll trust you that it isn't as hard as it looks. I think we'll give it a try! I'd love to try these with my 5/6 art class! Where did you find the square and triangle pattern? it will have the square and the triangle. I will change the links above to get readers directly to these patterns. Thanks for letting me know. School for Us: Thanks and I hope you do give it a try. Did you know that my computer will not allow me to access Circleofcrafters as this is a attack site. Perhaps you shoud let your fans know of this! Wrapping paper (as long as it is fairly thin) works great for this, too! 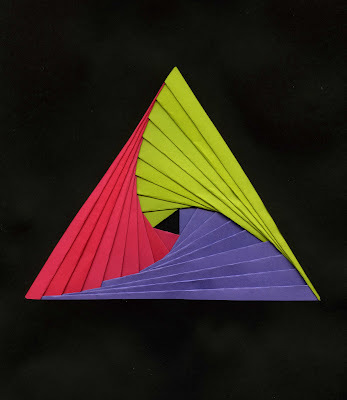 I did an iris paper-folding project with 3rd grade students last year. If you have only a short amount of time to complete the project, it is best to have the strips of paper already cut and folded, ready for the students to begin taping. Also, students of this age have a hard time pulling tape off a roller, so we gave each student a long strip of tape and they cut small pieces of tape off to tape down each strip.